Putting the exhaust back into exhausted. Or perhaps the tire into tired. How many puns can you make about a hotel with rooms themed around cars? Let’s find out. On the outskirts of the German city of Stuttgart, there’s a place called the V8 Hotel. It’s part of a complex known as Motorworld, which has boutique car dealerships, shops with luxury accessories, and classic car collections on display. 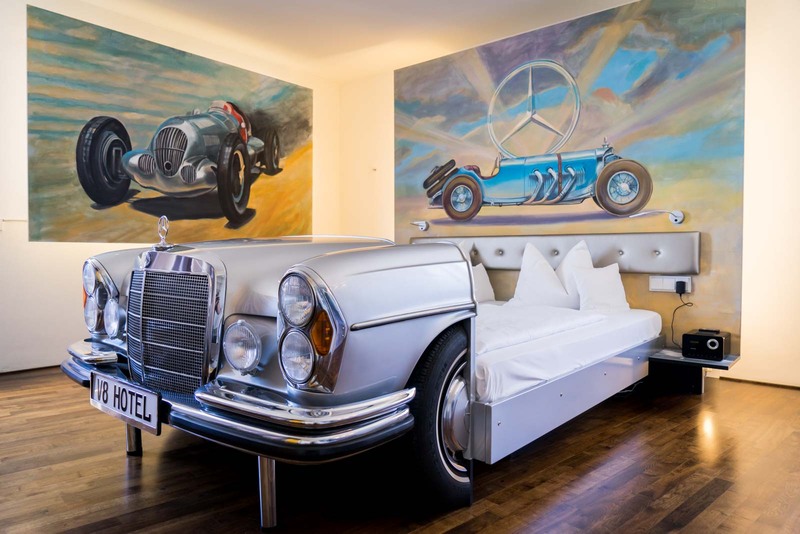 And if the motorheads need somewhere to dream, it would be one of the themed rooms at the V8 Hotel. There are more than ten rooms that have been decorated to look like different moments in the life of a car. There’s the car wash, the mechanics, the road trip, the camping ground – and even a look into the future. Most of these special rooms have beds that are made from actual cars. Some of them still have working headlights, to boot. There are lots of little decorations and pieces of furniture made from car parts too. Don’t worry, though, it’s all practical and there’s plenty of space to change gear. Some of the rooms are, I would say, an acquired taste. So, it’s lucky that you’re able to choose in advance what theme you would like, otherwise the colours could drive you around the bend. The building that the V8 Hotel is in actually has a bit of history itself. It used to be part of an airport that was built in the 1920s and used for commercial flights until the Second World War. The control tower is still here and it’s been turned into a four level suite that you can also book. It’s called the Mercedes Suite because you get a great view of the Mercedes-Benz factory from the terrace at the top! Finally, there’s a place where it’s ok to be asleep behind the wheel! Lots of fun for car enthusiasts – or anyone who wants something a bit different. The V8 Hotel is right next to an S-Bahn stop so you’ve got easy access into the heart of Stuttgart as well. Let me share with you now some of the V8 Hotel themed rooms. I was given special access to go in and photograph these ones before check-in. In the style of a garage, there are tools lying around and some racy posters on the wall. The bed is a Morris Minor with a worker still underneath it, it seems! Yes, you get to sleep in a Mercedes-Benz but you also have to have the huge washers on either side of you all night! Of course, it has a shower in the bathroom but I’m curious about whether there are other options to get clean in the morning? 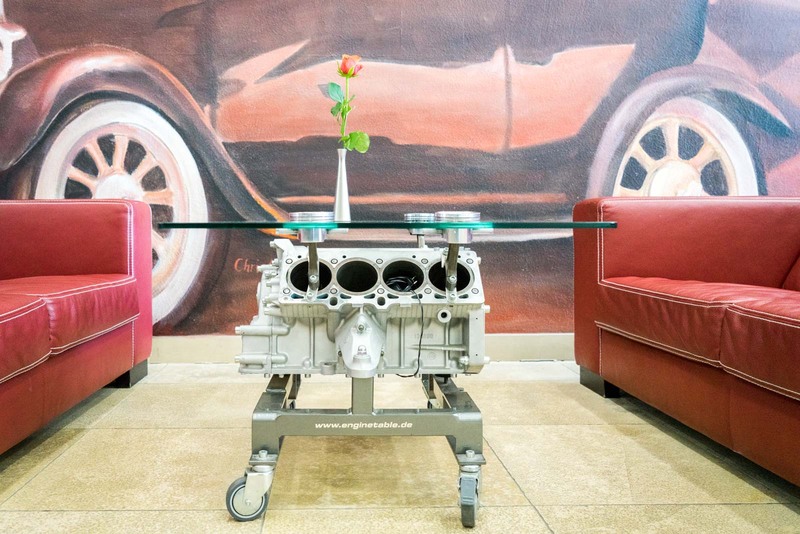 This room is dedicated to everything that makes a car even better – spoilers, rims, lights and bars. If you’re into that kind of thing, then you’ll probably love this. For me, it was a little too much! This is my favourite room. 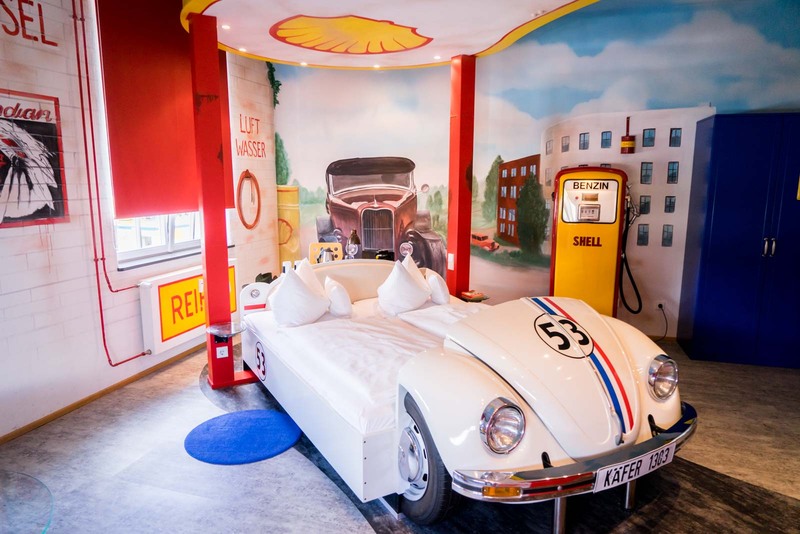 In the theme of a petrol station, you not only get to sleep in a Volkswagon Beetle but you’ve got a real petrol pump in the corner (not connected to anything, though!). The furniture and the bathroom are also pretty cool. 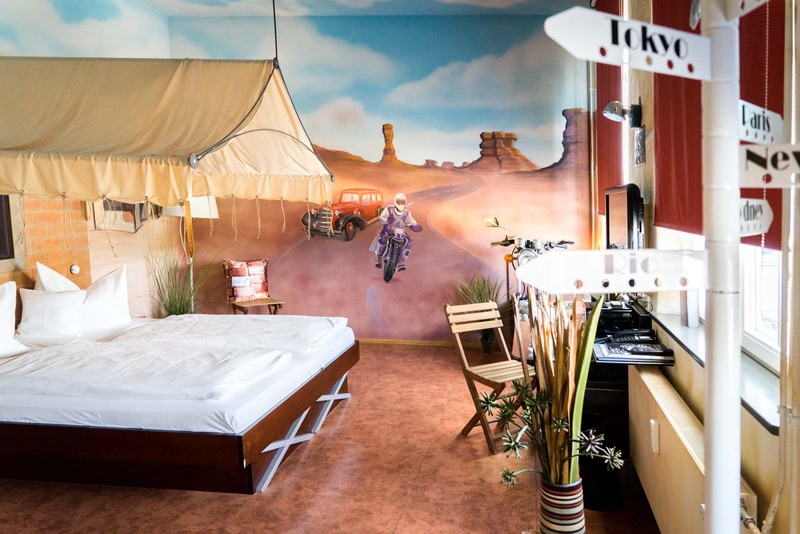 The Route 66 room is dedicated to the freedom of a road trip. It gives you the sense of being outdoors with the wind in your hair, the road stretching ahead of you. The highlights of this room are the murals on the walls and the natural light. Is this how the cars of the future will feel? That’s the idea of the ‘Vision’ room. Even if this isn’t exactly how driverless futuristic cars will look, it’s likely they will have the same sleek and minimalistic design. A bit like the Jetsons, right? This room is designed for families and I’ll explain why. It’s supposed to recreate a typical camping experience. So the structure you can see on the left is a campervan with a double bed for the adults. Outside, on the right, are two single beds for the kids. There’s also a hammock and an ‘outdoor’ bathroom. And finally this is the Mercedes Suite. Well, the bedroom, at least. The suite has four levels including a rooftop terrace with a view out over a park and lake. It’s very trendy and stylish and perfect for a special occasion. Not bad at all, are they? As I said, you’re right near an S-Bhan station so you can easily get into Stuttgart to see things like the Mercedes-Benz Museum or the Porsche Museum. And the Mercedes-Benz factory is right next door and it offers guided tours. If you love cars, this is the perfect place for a brake! I am a huge petrol head and this hotel looks like my cup of tea. Very cool – will have to check it out one day! You’ll love it then! Let me know what you think when you make it there!